Hunter Bell and Jeff Bowen’s autobiographical musical gains perspective with age. Originally written in 2004, it’s a quirky, navel-gazing piece that touched a nerve with the musical theatre community. It follows the authors as they write, re-write and develop an original musical. In its own, quaint way, it’s a 42nd Street for Off-Off Broadway, gathering momentum from a last minute entry in the New York Musical Theatre Festival to a genuine Broadway opening. Since its inception, it has become a fringe theatre staple, hugely popular with musical theatre aficionados. Robert McWhir presented the UK premiere at the Landor in 2013, but this current production at Above the Stag seems both more mature and endearingly restrained. Jeff (Jordan Fox) and Hunter (Michael Vinsen) are a musical theatre odd couple. Theirs is an idiosyncratic relationship, filled with awkward looks, non-verbal asides and a very real sense of entrepreneurial ambition. Vinsen and Fox capture this intimate partnership beautifully, underscoring their often comic performances with affection and understanding. They have great support from Kirby Hughes as Heidi and Natalie Williams as Susan, two characters who provide an actor’s perspective of life on and off Broadway. 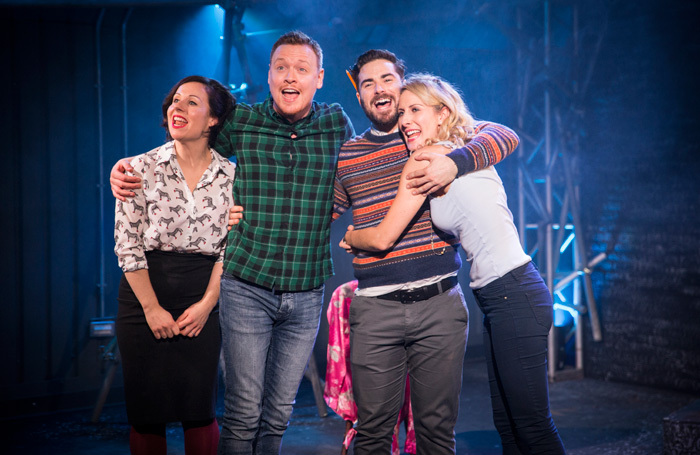 [Title of Show] is an undeniably niche show, but McWhir makes this less a showbiz tale and more a tale of friendship, forgiveness and the resilience of the human spirit. A must-see.